Brother’s In Arms: Hour of Heroes Forum Review by msbaylor. (Visit the thread for video and more pics. For more Forum Reviews, see the TiPb iPhone App Store Forum! 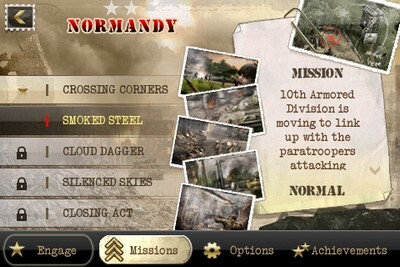 This new game from Gameloft has raised the bar yet again on their games. After finding out that this game has in the App Store I immediately downloaded it and started to play it. The graphics are that of Nintendo64, but the detection, Audio and AI are better than that of the N64. For those of you that remember the ‘ol N64, do you remember shooting the wall and the bullet holes didn’t show up? Or when you would attempt to run over someone with a tank and they wouldn’t die? Well unlike the N64, you can do that in this game, as well as get run over, bombed, shot, or punched in the face. After having played Brother In Arms I found that this game really sets it own standard. There is nothing like it in the app store. The controls in this game are my main complaint. But let's face it, these controls are for the most part the best and really the only way to control the type of game. First to control your direction, you place your thumb on the yellow dot in the bottom right corner and slide your thumb in the direction that you want to go. This is basically the same as ASDWZ on a keyboard for a PC game. To face a certain direction and ultimately where you aim, you use your right thumb, and move your line of sight around on the screen. 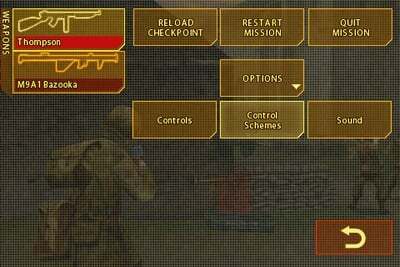 To shoot, you press the button in the bottom right corner. 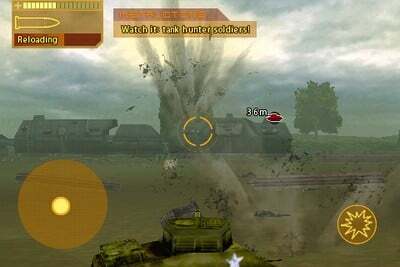 To throw a grenade, you press the grenade image in the upper right-hand corner, then you tilt you iPhone in the direction that you want to toss the grenade. Finally you press the "shoot" button to throw the grenade. 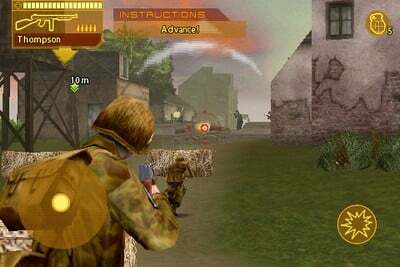 To operate one of the guns on the ground, you press the usual fire button, but you use the control in the bottom-left corner to control your aim. This control I’ve found ultimately difficult to operate. 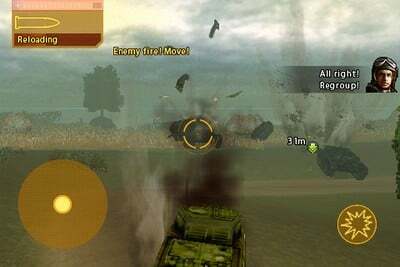 To control a tank, you use the same controls as if you were walking. The direction you go and the direction you fire can be controlled independently. 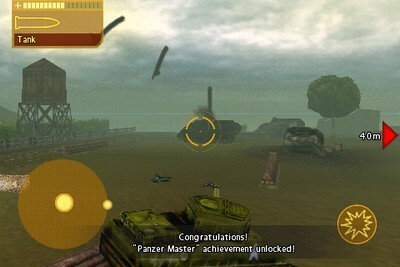 Finally to drive a jeep, a steering wheel will appear in the bottom left corner and a forward and reverse buttons in the bottom right corner. I found driving the jeep extremely difficult. Having bought Asphalt 4 from Gameloft, I am hoping they can implement the same controls for the jeep as are effective in Asphalt 4. This game uses more methods of control than I have ever seen in any app. While at first you might find it hard to control the game, but as you continue to play, you’ll get used to the controls. Like Asphalt 4, there are a few (3) control schemes - the one mentioned above, another that is like using two "virtual" joysticks, and another in which the direction you move is the same but to control your sight, you tap in the direction that you want to view. I recommend control scheme 1 or 2. As for shooting the enemy, your gun sight will turn red when you get near an enemy. The gun-sight utilizes snapping so that it is easier to hit your targets. However this is not true (snapping) if you are using a sniper rifle. You have the ability to hold up to 3 weapons (from what I've done so far) and by tapping on the current gun icon in the top left-hand corner you can change your weapon as well as numerous other options. Controls can seem awkward or hindering during game play as it might block your line of sight.